Model 1 - 2 bedrooms, 2 baths, 1,205 Square Feet with attached two car garage. Model 2 - 2 bedrooms, 2.5 baths, 1,508 Square Feet with attached two car garage. Model 3 - 3 bedrooms, 3 baths, 1,589 Square Feet with attached two car garage. Model 4 - 3 bedrooms, 2.5 baths, 1,669 Square Feet with attached two car garage. Model 5 - 3 bedrooms, 3 baths, 1,747 Square Feet with attached two car garage. 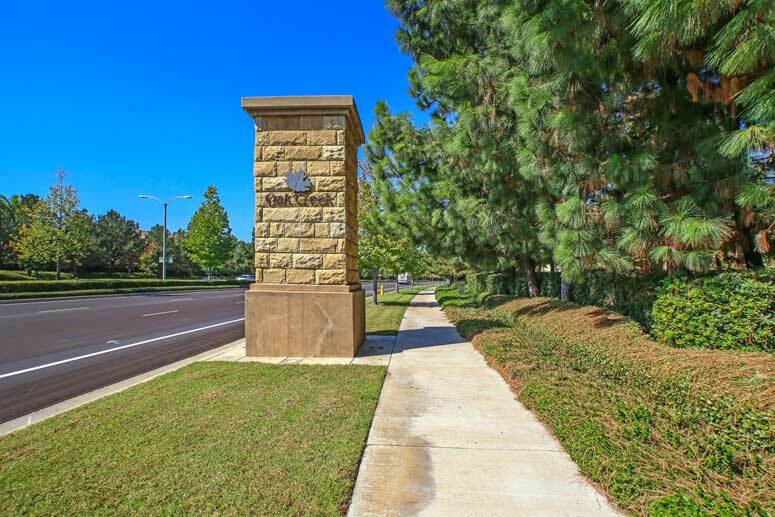 It complex is conveniently located with walking and short driving distance to local number of Irvine Company owned and managed shopping centers and Oak Creek Elementary School. Amenities are great offering number of green parks, picnic tables, soccer fields, tennis courts, club house, swimming pools and the famous Oak Creek Golf Course off of Irvine Center Dr.
Schools are again of the Irvine award wining school districts; Oak Creek Elementary School with 10 ranking located on 1 Dove Creek, Lakeside Middle School on 3 Lemongrass Irvine and Woodbridge High School on 2 Meadowbrook Irvine. The Master HOA to Oak Creek is Oak Creek Village Maintenance Association managed by Merit Property Management located on 1 Polaris Way Suite 100 Aliso Viejo CA 92656. They can be reached at 949.448.6000. HOA dues are $85 per months. Parks association are served by Oak Park Maintenance Association managed by Action Property Management located on 2603 Main Street Suite 500 Irvine CA 92614. Their contact number is 949-450-0202. And Sub-association is Acacia Maintenance Association managed by Crummack Huseby Property Management located at 1 Spectrum Point Drive, Suite 320 Lake Forest California 92630. They can be reached at 949-367-9430. Sub-association dues are $74 per month. So if looking to buy or lease in Acacia homes in Oak Creek then, please, have a look around, and contact us with any questions you might have about the market or our services. No question is too mundane - we want to help!